Remember my obsession with O Plus D (if not, you simply MUST go see here)~ Well their designer, Olga Krigman, threw a little holiday sale/gathering at La Dita in Echo Park last night, and it was more like a mini gallery showing of all the cards up on the walls. Each and every one even more fun to see and read in person (gorgeous rounded edges and printed on great card stock!) Pics below ~ And if you haven’t stocked up on holiday cards yet, this is the ONLY way to go. Well, they are the best i’ve seen around anyhow! 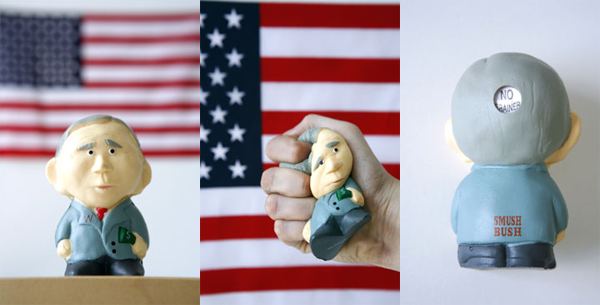 For all Geoff McFetridge fans… Creature Off My Back was done in collaboration with King Of Mountain. Fun little poem and more images below… “If you ask some people… some people agree, Like your shirt says “yes” and mine says “oui”…. Lamy’s were always my first love when it came to nice pens, i had a few 2 and 3 in ones in those nice black metal barrels, always LOVED the weight of them. Take a look at the new Lamy Pickup Pro, designed by Wolfgang Fabian. It’s literally a pen in a pen, but not in the twist to switch style, more like there’s a mini highlighter you can unlock by pressing the yellow button, and then it pops out the top. (Nice for two handed, write+highlight). It is described as naturally anodized aluminum barrel with massive, spring-mounted metal clip, turning mechanism and movable telescopic point. Remember WindowZoo (old post here)? Those fun bird silhouettes that are being set free around the world then photographed and and flickr’d and mapped? Well it took over a month, but some finally flew over here from Switzerland… so check out the images and packaging below. Since they JUST arrived, i have not yet decided where to free my mini flock of hummingbirds (one landed on my powerbook and looks like its about to be eaten by the apple), two flamingos, and two eagles(? )… ideas? The image above is a fun postcard that was included… mesmerizing graphic. Borba Margo, it’s a British line. Had a bit of trouble finding much info, so feel free to enlighten me. Noticed their “Break Up” keyring over at Colette, and since there was no explanation of the name, my imagination ran wild and noticing i had the keys from some ex’s apts and my old apts on my keychain for some reason, felt like theirs was symbolic of a break-up where the heads of those keys strung together represent pasts not to revisit. From what little i know of the brand… Colette gives us this: Borba and Margo produce objects that in their own words “cherish human desires and fantasies revealing something essentially magical.” So while googling them… also came across their collection at Rendez-vous Paris, and the Large Safety Pin purse and necklace/purse were quite fun as well. The genius that is MOO launched last week, and i’ve been meaning to post it for days now, naively thinking that in between everything else i would have had time to arrange photos, and print cards, and come up with great images to show. Unfortunately life got in the way momentarily - so here’s a post just in case any readers haven’t heard about them yet… What is MOO? It makes your flickr pools something tangible and useful - business cards in the proportions i love, but with any images you choose on the other sides! Adorable, playful, genius ~ also check out the MOO HQ Flickr set - i love seeing their behind the scenes shots of these great little cards. Tarot Cards - simplified down to street sign vector art… see full poster below as well as the “as above, so below” london tube styled map of Kabbalah. via Boingboing. So while in the post below i focus on how fun the interface and animation interactivity is - this post was worthy because the toys themselves are so fascinating to me. Our old toys are growing and evolving with the times (remember monopoly started the credit/debit card edition? )… So here with brio, we have EMO, where when placed with some mail on his box, makes noises? - Lazie’s CD Burner, where you push buttons to activate laser lights and jet engines - the Attacker + Viruses, a crazy offroad vehicle - Bernie’s Flashing Diode, when you pass under it, it flashes. Dex’s Search Pod has the magnifying glass and flashlight… See? 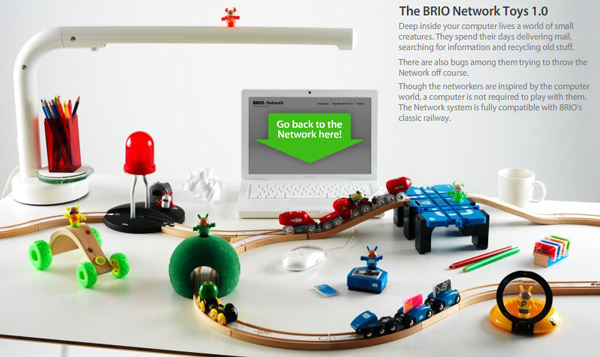 Woody toys, taken to a whole new level, i WANT these for my desk, they are a) adorably amusing b) strangely techy yet woody… BRIO NETWORK 1.0! oh, and don’t miss the video! If anyone were to rip off the OS X Dock (and improve it! )- it’s apparently BRIO - yes the toy company. And their new Network 1.0 line of toys. More to come in the next post about how brilliant they are. Check out the animation in each section - this is one site worthy of having you explore every bit of it.